My wife and I aren’t sure why this is, and for the past six years, we’ve been assuring Annabell that she isn’t in danger. I mean, she doesn’t even venture into the kitchen. But from the safety of the living room, if she hears the pre-heated oven beep, the heating element click when the temperature fluctuates, sizzling vegetables or someone chopping an onion a little too loudly, she becomes terribly frightened. If you live with a companion animal long enough, you develop a rapport with them. They understand when it’s time to go for a walk, time for a treat, or time to turn in for the night. You try your hardest to understand why they’re upset, your intuition kicks in if they aren’t feeling well, and you can’t help but smile when you see them excited about something. What happens when your companion animal is telling you something that you can’t understand? 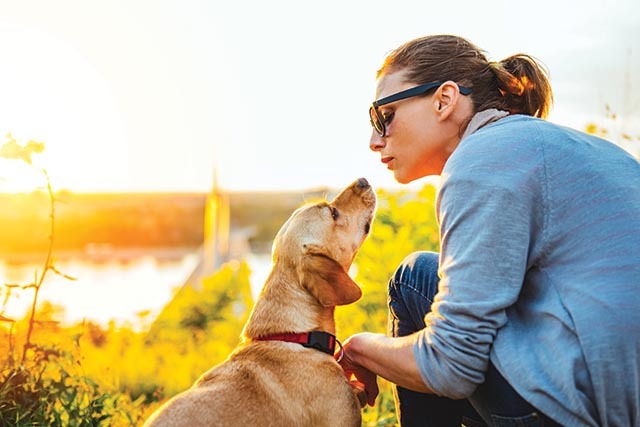 The concept of “animal communication” is exactly what it sounds like, and Kathy Van Guilder, Dawn Huebner, and Erica Pointer Kobett are among those working in the Twin Cities area as animal communicators. The three women say they’ve been aware of their deeper connection with animals since they were young. Huebner said she remained quiet about her experiences, thinking it was something everyone could do but simply didn’t discuss. Those early instances eventually led to lengthy careers in this field—Pointer Kobett has been a professional communicator for six years, Huebner 12 years, and Van Guilder for over 15. There is more to animal communication than esoteric childhood experiences and a fondness for animals; both Pointer Kobett and Huebner enrolled in either classes or training programs to validate and verify their work. “It gave me the courage to actually claim to be able to communicate with animals,” Pointer Kobett said of the class. Huebner believes animal communication is much like any other skill or talent. Van Guilder, Pointer Kobett, and Huebner use a mixture of in-person, face-to-face, phone and email to communicate with their clients, many of which are in the Twin Cities area. Photographs along with information about the animal’s past and personality are helpful when communicating via email or the phone. The animal’s energy also is important in the communication process. Van Guilder said early in her process of becoming an animal communicator, she worked with intuitive energy healers. “I learned more about myself, and the idea that everything and everyone is connected,” she said. All three communicators have experienced myriad situations and circumstances when working with clients. Behavioral problems and end-of-life issues are among the most common and difficult. Van Guilder said an animal’s behavioral issue is often a mirror to something its human is going through. Missing or lost animal cases are also common, and Huebner said those are her most challenging to work with. Pointer Kobett said that through her communication work, she can be “overwhelmed by each little soul,” adding that she is honored to be able to speak with her clients and learn from them. Both Huebner and Van Guilder echoed those sentiments.